Coach Ben thought that Athlete Sherie and Athlete Ben were in need of a full 100-mile day on the bikes in preparation for the long day of the Maratona. And because we both love riding to and from home, we decided to do a self-supported century from our own garage. The route planned only has three big climbs, with lots of flats between. So comparatively, it was to a an “easy” century. From Albany, north on San Pablo Ave (quiet early on a Saturday morning), then SPDR to Pig Farm Hill, by Pleasant Hill BART to Ygnacio Valley Road. 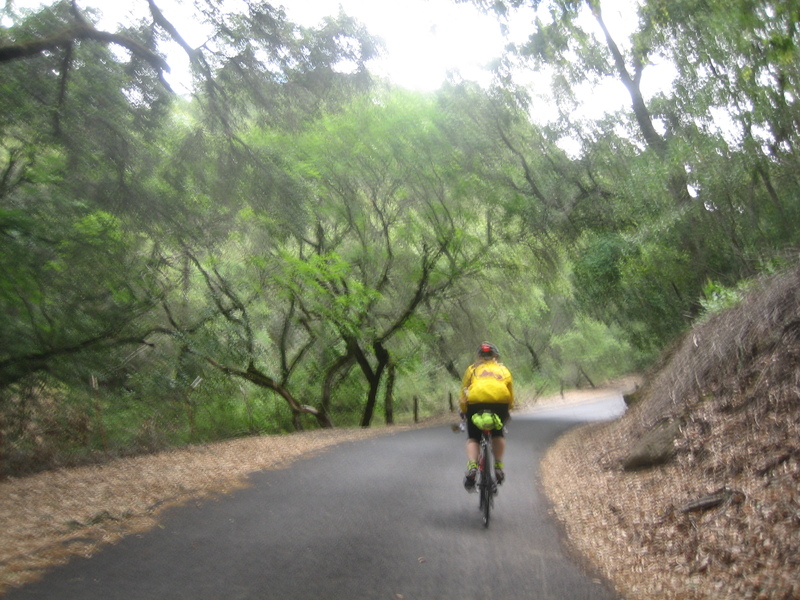 Then Morgan Territory Rd to the Livermore Valley, through Danville, Lafayette and Orinda back home. We had a nice time riding very early, smelling the bacon cooking in cafe’s as we rode by. Nothing like the smell of bacon cooking and coffee brewing to wake you up, even if you aren’t stopping to imbibe! 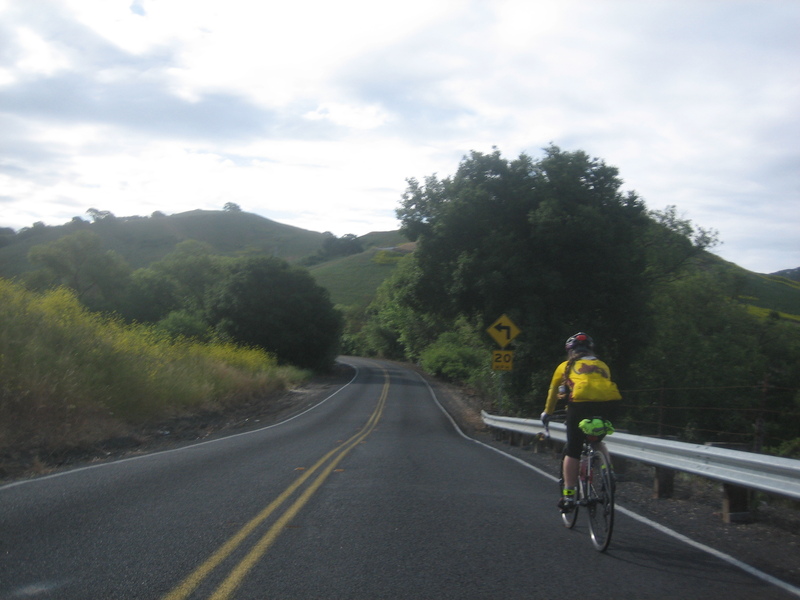 We felt great spinning easy up our favorite: Alhambra Valley Rd. We had to dig a bit deeper up Pig Farm Hill, but stayed at an easy pace through the Pleasant Hill area and out Ygnacio Valley. Nearing Pleasant Hill we saw the GPC group led by Estella going on some mysterious route, waving as we passed in the opposite direction. We took breaks at the golf course on Grayson (people are always so nice there even though we are not golfers, as we use the restrooms and sit at the picnic tables) and on the square in Clayton. 30 mph crosswinds would make the downhill through the grasslands on the south slopes tricky and nerve wracking. A rain squall would blow through before we had the shelter of lunch, but we did not get too wet. We really were ready for lunch, both low on energy, when we made it to Blackhawk. 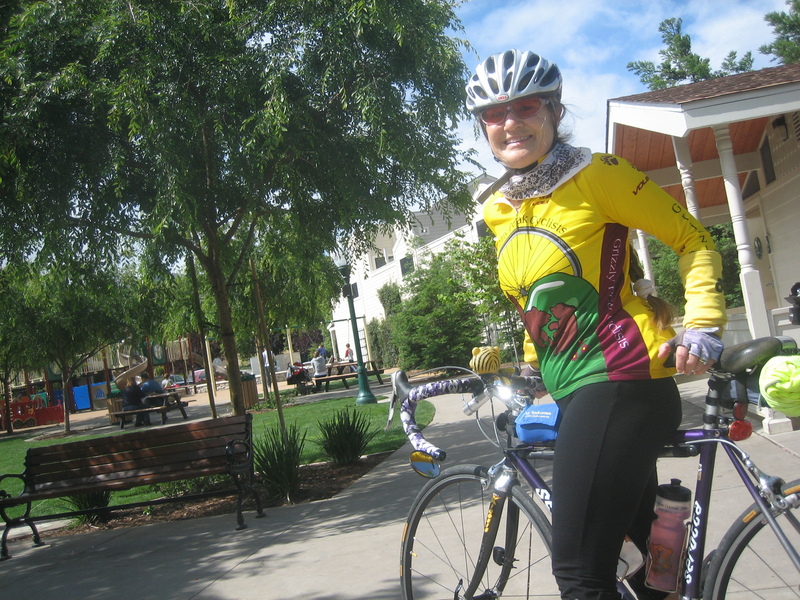 We each had a full sized burrito, and amazed the 19-year old cashier when we said we had ridden from Berkeley. After that, and a 2-dollar tip, she was very helpful. And a full stomach was great for both of us, although we took it a bit easy digesting for a few miles before we were back in rhythm. The library in Lafayette has very nice public bathrooms. The “downtown bypass” route through Lafayette is well signed, but wanders up and down and all around to miss one mile of the busy Mt Diablo Blvd. Not worth getting off the main drag there. There is no flat route from the east to Orinda. As we approached Wildcat Canyon Rd heading home, the clouds gathered. Looking up, Ben feared rain but didn’t say as much to Sherie, only “I am not stopping on top. I will see you at home.” Well, it sprinkled at El Toyonal, rained steadily by Inspiration Point, and poured going down Spruce. No way Ben was stopping to wait for Sherie in a downpour! Ben had to remove his eye glasses to see, and even then blinked repeatedly to function. Hard to wipe your eyes when you are squeezing both brakes to keep the rims dry enough to have some friction for stopping! Ben arrived home soaked to the bone and shivering from the chill of the last three downhill miles. He quickly stripped and warmed up in the shower. Glad I wasn’t waiting at some BART station. It made Sherie’s day when Ben greeted her in the garage with a large towel, then made dinner quickly while she showered and warmed up. The big rain shower sure put an exclamation to the long day in the saddle!